This is transistion month for me. I usually spend the first half of September repotting the smaller brugmansia. The last half of the month I try to get the Mother sized Angel trumpets repotted. 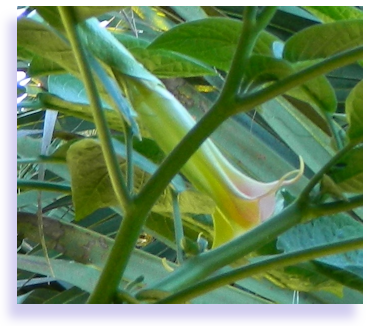 Brugmansia trees grow very fast, and eat a lot of nutrients. So once a year, they need to be pruned and repotted. With pruning comes cuttings. And since cuttings can only be taken in cooler temperatures, I have to wait to near month&apos;s end to repot the larger mother brugmansia trees, which have bigger root mass and will have those trimmed too. That is, if Mother Nature allows, and I do get a reprieve from the high temperatures. 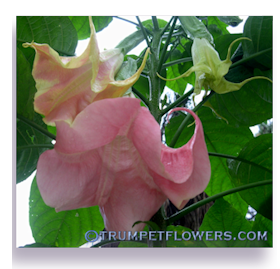 But the smaller, younger angel trumpet trees can be done now. Since my husband and I have so many, we will only do a couple of them a day, which not only saves our backs, but allows us to work in the early morning hours, before it gets too hot. This is also the best time to do it for the brugmansia trees. Exposing their roots to sunlight and heat is not a good thing. So we do it in shade and as quickly as we can. These smaller Angel Trumpets were potted out in early spring. After spending the growing seasons in the partial shade of the giant pine trees, they will now be ready for larger pot sizes and new soil mixes. It is as it always is in September, extremely humid as the sun rises, with it nearly 100%. So off we both go, ready to grab the first angel trumpet from her spring and summer spot. It's cultivar Rubirosa, whose not so large she can&apos;t be managed, and only in a 5 gallon pot. First we have to get her out of the ground. We sink the Angel&apos;s pots into the soil at soil level for several reasons. Firstly, it keeps them from tipping over. Secondly, it allows the roots to go into the earth, which allows for more top growth. 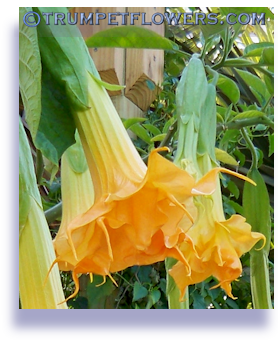 When digging up a potted brugmansia, one tries to save the pot if possible, for later use. Some of them will have deteriorated and are thrown out. Our sturdy wheelbarrel is on hand, for hauling Rubirosa over to the &apos;Green&apos; house area. This is where we will be repotting all of the brugmansia. 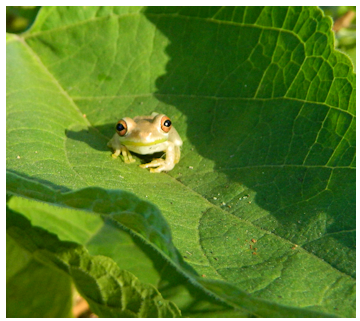 DH has built a large area that is covered for shade protection in the sunny summer months. It provides the both of us respite from the glaring sun, as well as the Angels. Soil mix is made up ahead of time, in large batches. I use a 20 gallon tupperware tub, and a shovel. All the stuff is right there, the compost, peat, perlite, pine bark chips, sand and Osmocote. I could use an electric standing cement mixer to do the mixing job for me, but since we&apos;re only doing a couple of plants a day, I don&apos;t feel like hauling the clumsy cement mixer over to the Green House area. It is good to get a little exercise, right? First my DH bangs on the sides of the large pots, trying to loosen the root system inside. If the brugmansia has any roots growing out of the side-holes and bottom-holes, they are cut off with sharp, sterilized pruning shears. Together we slip the Angel out of the old pot, and lie it carefully on the ground. The larger planter pot is right there, ready to be used. 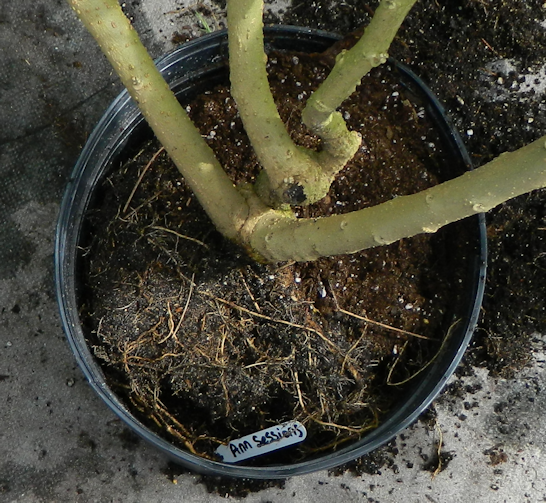 Before repotting it, the root ball is thrashed down along all of the sides and the bottom. Just hack the roots with a machete or if you want it even easier, an electric SawAll will also do the trick. We cut at least 2 inches off the diameter on medium sized Angel trumpets. Then we took a mental note of the new pot and how much soil needs to be placed in the bottom of it versus the rootball of the Brugmansia. Filling in the bottom to what we think is an appropriate layer of soil, we then test run the brugmansia by holding her over the pot and rest her roots on the soil. Adjust yours accordingly. Then we fill in the sides of the soil, tamping it down with balled fists to make sure the plant is held upright. No air pockets where roots are, it will halt growth. 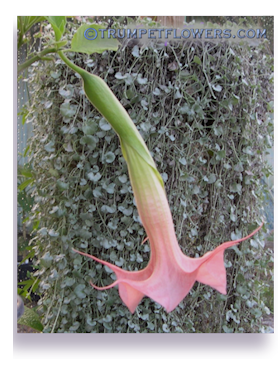 Then we deeply water the brugmansia, and always make sure to include Superthrive in that water. Superthrive takes the edge off of transplanting. Make sure to keep the rootball moist, and within a week or so you will see new top growth. And that&apos;s it. Tomorrow we will move on to the next set of brugmansia, until we are all done. Whew! 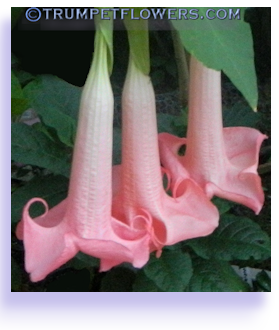 This entry was posted on August 31st, 2013, and is filed under Brugmansia Blog.